I just had two Minneola Tangelo trees planted as part of our landscaping at our new house. The trees are about 4' tall and have several un-ripened tangelos on the limbs. Since this is September, it seems that these tangelos are "left over" from last year’s growth and should be removed. Perhaps a bit of prudent limb trimming would be in order, too? Stop, put down the pruners, and slowly step away from the trees. No. Further away; I want to see more daylight. First, let me say: I understand. It's a guy thing – not entirely, but mostly. We get a clunking clothes dryer, and we must open that panel labeled "do not open." We get a new jigsaw, and suddenly the world must be cut into fancy curves. We get a new grill, and every meal must be barbecued. We get a new tree, and it must be pruned. I understand. I sympathize. I hear that faint pleading in your final question. I too have used that same tone of hopeful inquiry while gripping a shiny new reciprocating saw and asking, "Perhaps a larger front door would be in order?" The unripened fruit on your tangelo trees are left over from this Spring, and if allowed to grow they will ripen and be ready to pick this coming Winter. In other words, they are the current crop. The only reason you would remove them is if you thought they would be a stressor on the newly planted trees. Citrus can be somewhat variable in their season, but generally speaking the fruit that is pollinated in the Spring will grow throughout the Summer months and ripen in the Winter. Unlike deciduous fruits, citrus take a long time to ripen, and if you were to remove un-ripe fruit every September you would never have any fruit. As to the prudent limb pruning, skip that also. Newly planted trees are stressed, and the best remedy for stressed trees is to allow them to keep all their leaves. Right now, those leaves are shading the trunks and branches, cooling the immediate area around the tree, and providing the trees with the sugars and starches they need to establish new root systems and new top growth. As we go into the cool season, your citrus will need their energy reserves to survive and thrive. 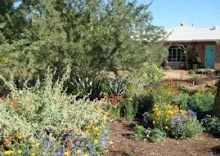 And you want them to establish well now so that they will be prepared to flower next Spring and then have the strength to make it through their first Arizona Summer. Keep in mind also that Wickenburg might be considered a marginal area for citrus, depending on your immediate micro-climate. Minneola Tangelos are an excellent choice for the cooler-Winter citrus areas, but you will still want to leave as much dense foliage as possible, to help insulate the trees against Winter freezes. In short, I'm ruining all your fun. I know, and I'm sorry. Here's what you do instead: buy a new set of pipe wrenches, crack open a few walls, and take a good hard look at your plumbing. That sounds like more fun anyway.